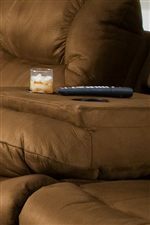 This Power Wall Hugger Recliner will give you all the comfort you need to keep you off your feet for hours. With its fully padded chaise and plush head rest, this chair will become your favorite napping mate. Recline with ease at the push of a button, and don't worry about taking up a huge corner space for this chair - it can be placed inches away from the wall and save you lots of space. The Avalon Comfortable Power Wall Hugger by Southern Motion at Turk Furniture in the Joliet, La Salle, Kankakee, Plainfield, Bourbonnais, Ottawa, Danville, Bradley, Shorewood area. Product availability may vary. Contact us for the most current availability on this product. The Avalon collection is a great option if you are looking for Casual furniture in the Joliet, La Salle, Kankakee, Plainfield, Bourbonnais, Ottawa, Danville, Bradley, Shorewood area.